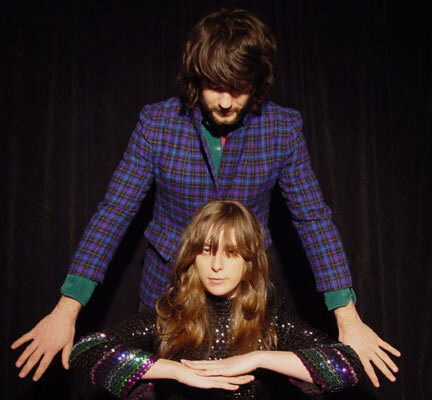 Beach House's Victoria Legrand and Alex Scally. Leave it to the fine folks at Club Mercy to bust out the big guns just as the summer music buzz seems to be wearing off. This Monday, the booking powers that be will bring Baltimore’s beloved Beach House to Muddy Waters Cafe for an intimate, all-ages show that you dare not miss. Known for their love of all things vintage sounding, bandmates Victoria Legrand and Alex Scally are currently gearing up to hit the road and tout the songs behind their stunning February release, Devotion. Their stop in Santa Barbara (the third on a nearly three-month-long cross-country jaunt) will undoubtedly be a sight to behold – and a sound that will not soon be forgotten. Since forming in 2005, Scally and Legrand have been handcrafting deeply personal, compositionally lush, and organ drenched ditties that pull from an innumerable list of influences. And despite the fact that Legrand and Scally are the only two musicians involved, the most recent result of their collaboration is about as sonically loaded as an album gets. Recently, Scally phoned in during a mid-day shopping venture in his hometown of Baltimore to talk writing, recording, and Britney Spears. Your music is most often categorized as “dream pop.” I know a lot of musicians hate being categorized at all, but given the opportunity, how would you describe Beach House’s sound? Well, I think it’s really hard to describe most music. I think, even though dream pop is silly, it’s good, it’s fine. As far as labels go, it’s not that bad. We definitely both love pop music a lot. We don’t think there’s anything wrong with pop music. I guess they say “dream” because of the way we write it. We just love pop music. I mean, we’re making it, we’re just doing it how we want. I guess a lot of instruments we use – the organs, the way we use the voices – people have just put this dream thing on there. It works though. It’s fun. How did you and Victoria meet? Did you hit it off immediately? I was brought into another band that she was in and the band was kind of dysfunctional – nobody really did much work for it. And we had just sort of busted out a few times playing music together. We were hanging out a lot; we became friends through the band. And whenever we would make music together there was this kind of ridiculous chemistry; like an immediate chemistry. It’s one of those things that’s really cheesy to say, but it’s just completely natural and it feels perfect and exciting. And it still happens whenever we play and make music together. It’s just a wonderful, nice union. I know that the whole duo thing has been something you have both maintained as being a huge part of your sound. How does the songwriting process work? Are there some tracks that one of you is solely responsible for, or is everything collaborative? I think one of the reasons why it’s easy for us is because we have a really similar ear. We like the way similar things sound. We’ll hear something and immediately jump to it. It’s great. But she also does things that I would never think to do. A lot has been written about this epic collection of antique organs you guys use. How many have you two collected so far? It’s not that epic. There’s a lot. There’s probably between 13 and 15 sound-making organs in our practice space that we just toy with. Sometimes you need a sound and you just have to go find it. And how does that work when you go on tour? That’s the thing. I don’t know what’s going to happen for future albums. Our first two albums were sort of all written with this idea that we have to be able to play it live. So the third member of the band was our tape machine. We recorded everything on tape – usually the bass and the drum – and then we play with it and have a live drummer, too, to bring that to life. We kind of based everything around these tour organs that we can travel with and a guitar. And there’s a bunch of songs that we’ve just decided we can’t play live. We just can’t rearrange them because the organ cues were such an important component of the sound. Do you think that is something that will change in the future? I think one of the things that’s been really good about touring is it’s constantly forcing you to reevaluate. You get sick of your old songs and you want new things. Lately, Victoria’s been really sick of being stuck at the organ because it’s like you can’t move at all. When you’re singing and playing organ you’re just stuck on stage, and she’s got a lot of movement in her. So we’ve been thinking of and we’re almost trying to compose around having her be free. So this is a new idea that’s coming. So much of Devotion carries this kind of otherworldly, antique-y sound. I’m at times reminded of ’60s country and even some ’60s and ’70s surf rock. What do your record collections look like? It’s always changing and fluctuating. And we both like so much stuff – there’s really no boundaries. I have no philosophical reason about music; I have no intellectual reason about music. If I just like it, I like it, and I think Victoria’s pretty much the same. She listens to Madonna, Britney Spears. I listen to pop country. It’s kind of like everything, you know? There’s so much. I haven’t really been listening too much lately because I’ve been writing. When you’re into writing music you stop listening for periods. But there’s so much good out there. Both albums were recorded in what many bands would consider an obscenely short amount of time. Do you guys just work around the clock for as long as it takes to finish? How much writing gets done in the studio? This may be more of a question for Victoria, but a number of the song lyrics read like very personal letters to someone. Was there someone in particular that was being addressed on Devotion? She never writes with specifics in mind. She writes lyrics and she doesn’t ever write like, “I’m going to talk about this thing that happened to me.” She lets things out, and the one thing we agree is that we know it’s time to make an album when a family of songs is done. Usually a time period of life will have a real feeling to it. And I think that that album was that year for us. It was from when our first album came out to when we recorded it – pretty much a lot of tours and a lot of weird adjustments and intensity. I think that is just the family from that time. And I think that a lot of the lyrics and the vibes just channel that energy. That kind of manic adjustment, missing home, missing your loved ones, the constant strangeness, that vibe. Are there any songs on the album that stand out as your favorites? “Astronaut” I really like, “You Came to Me,” “Astronaut,” and “D.A.R.L.I.N.G.” It was a lovely, amazing process to make this album. It was probably one of the most intense things – definitely it’s probably the most intense thing I’ve ever done. And finally, anything you’re looking forward to on this tour? California is always something to look forward to. I’ve never been to Santa Barbara. I’m excited to get out there and check it out. I really like to play in new places. Beach House will play Muddy Waters Cafe (508 E. Haley St.) on Monday, September 29 at 8 p.m. Opening the show will be San Fran trio Lazarus. Call 966-9328 or visitmyspace.com/muddycafesb for details.